Sasquatches need splitboards, too! The Lib Tech Skunk Ape HP C2 BTX Splitboard will make any mountain wandering weirdo proud. Featuring Lib's Horsepower Construction, this splitty is lighter, stronger, and more lively to make trips into the backcountry that much easier. 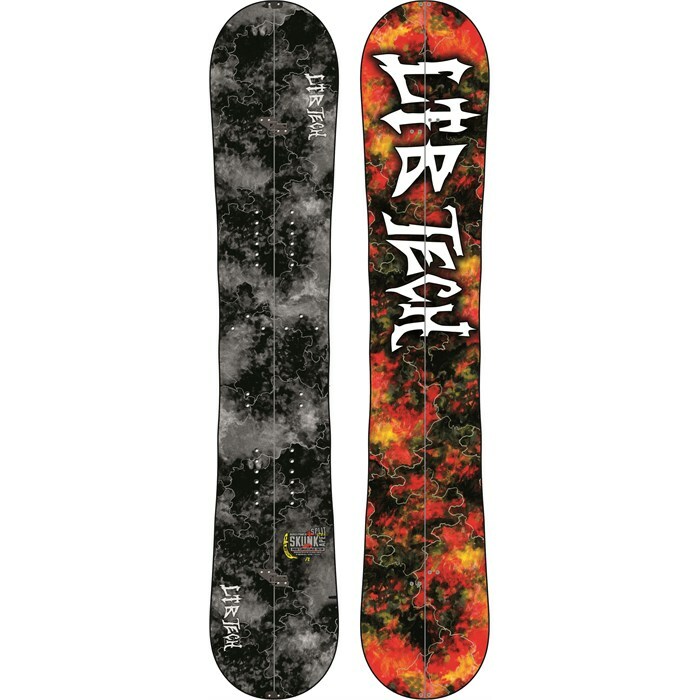 The C2 BTX rocker profile is one of Lib Tech s favorite because of its effortless float in deep snow and power and stability through hammer turns and drops. The Karakoram clips will keep this split noice and tight, so you won't feel any slop while charging the gnarliest of lines. Now get sassy and find your Sasquatch friends in those smokey, misty woods. You'll be missed friend. C2 BTX  Lib's favorite camber rocker blend for aggressive power snowboarders. Solid tip and tail pressure for power, pop, precision and end-to-end stability combined with a medium amount of pressure between your feet delivers float, carving and edge hold. Flex 7  A stiff aggressive flex designed to provide stability on big take offs and excellent response for cruising through powder. Directional Twin Geometries  This effortless freestyle and freeride geometry starts with a Twin chassis (from contact to contact) but with an ever so slightly longer nose than tail that allows the board to float on powder and blast through crud. It's a Twin with an advantage. Basalt  Volcanic, organic, additive-free reinforcements are made from Mother Nature's finest minerals. Flex modulus is synchronized with Lib Tech's resin system for maximum strength and minimum weight. Power Transfer Internal Sidewalls  The PTIS are lightweight internal sidewalls made from Birchwood to add durability where you need it the most. UHMW External Sidewalls  Ultra High Molecular Weight exterior sidewalls made from soy-based elastomer are laminated to five internal wood layers for totally bombproof sidewalls. Sintered Base  Fast, tough, maximum wax retention. Magne-Traction®  Strategically located serrations on your edges that create confidence-building, fatigue-reducing, edge hold all over the mountain especially on hard pack and ice. Bio-Beans Sparkle Topsheet  Biopolymer made from castor bean oil is displays graphics beautifully in an environmentally friendly manner. Horsepower Construction  The experiMENTAL Division's favorite high performance combination of lightweight, strong and environmentally friendly materials is composed of Basalt Glass (no fiberglass), a Colombian Gold Core, and Bio-Beans Top materials. Karakoram Clips  Karakoram Splitboard Clips optimize the performance of your splitboard. They firmly secure the splitboard halves together, eliminating slop in the seam. Say goodbye to tip and tail rattling forever – your splitboard will ride like a normal snowboard in all conditions.